is a Lakota name for a conical tent traditionally made of animal skins and wooden poles used by the nomadic tribes and sedentary tribal dwellers (when hunting) of the Great Plains. 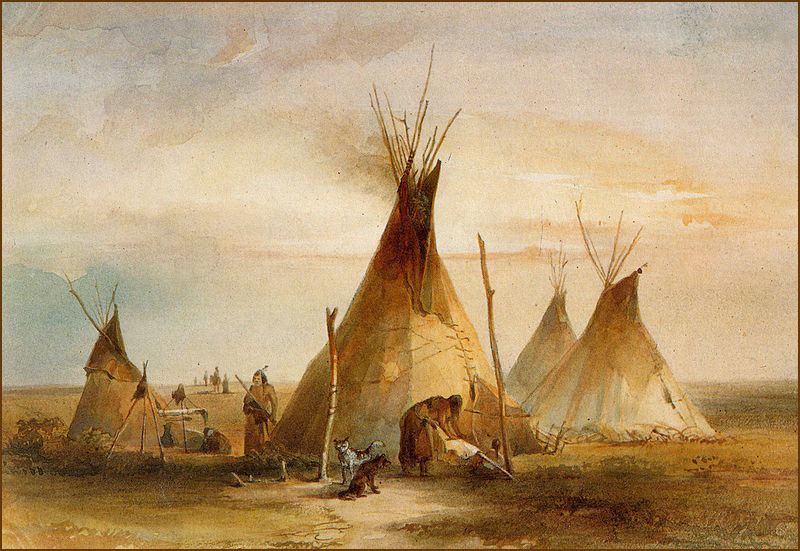 Tipis are stereotypically associated with Native Americans in general but Native Americans from places other than the Great Plains mostly used different types of dwellings. The term "wigwam" (a domed structure) is sometimes incorrectly used to refer to a tipi. The tipi was durable, provided warmth and comfort in winter, was dry during heavy rains, and was cool in the heat of summer. Tipis could be disassembled and packed away quickly when a tribe decided to move and could be reconstructed quickly upon settling in a new area. This portability was important to Plains Indians with their nomadic lifestyle.
. tento 天幕（テント） tent, Zelt . on five bamboo canes . . .